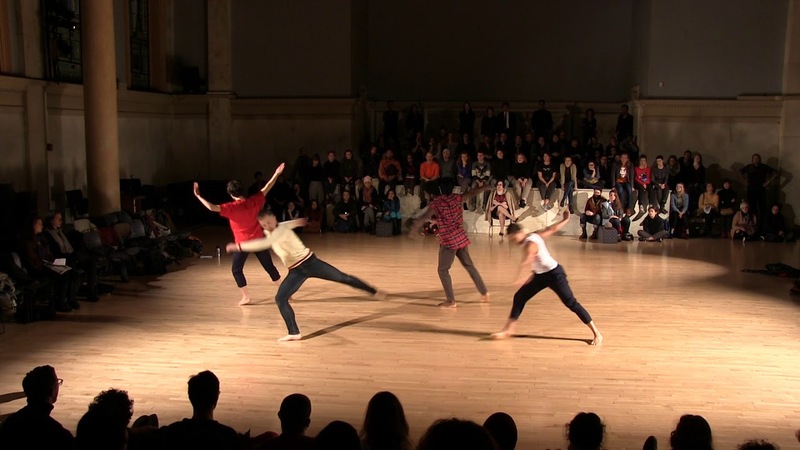 Kyle Marshall Choreography at Judson Church, November 20, 2017. Kuumba Dance and Drum proposes a 4-day residency in Hudson, NY with Kyle Marshall and Company from June 10-June 13, 2020. Kyle Marshall, the 2018 Bessie Award artist, will work to develop “Reign”, an evening length work shrouded in Christianity’s influence on the body, and American culture. Using text from Holy Bible as impetus, dancers Oluwadamilare Ayroinde, Bria Bacon, Miriam Gabriel, Kyle Marshall and Myssi Robinson along with sound designer Cal Fish, are in a process to understand how words and belief have the power to influence bodies, communities and nations. With this dance, Kyle seeks “to undo mainstream white supremist depictions of celestial beings, embody old and new ways of uplifting the spirit, and release guilt from our queer bodies.” Reign is interested in how a theater can become a sanctuary, an audience a congregation, as we create a space for reflection, truth and joy in an age of unbelief. The Hudson Residency will take place from June 10 to June 13, 2020. The Hudson Area Library will serve as a community partner to present a public movement workshop and discussion about Reign prior to the public performance on June 13, 2020. A planning visit to the Hudson community by Kyle Marshall will be in June of 2019. Kyle will present a dance workshop at the Hudson Area Library as part on his introduction. Kyle will perform solo work at an evening gathering. Space 428 and Basilica are venues that Kyle will explore for the presentation of Reign in 2020. Kyle’s time during the Hudson Residency would allow him to develop and share Reign in a more informal setting, get feedback from the audience, and fleshing out final details before the Shed. The work will also incorporate a Kinesthetic Sound Instrument, allowing the dancers to intuitively live record, manipulate sound, trigger sonic events, and kinesthetically improvise using movement. The instrument built with support from the Electronic Arts Institute at Alfred University would be used in Hudson at the first draft performance of the whole dance. The Hudson residency would be a space to work out the details of installation of the instrument and see how the work will flow in front of an audience prior to our limited tech time at The Shed. After the performance, Kyle and company will go back in the studio to flesh out details, and nuances before the premiere.